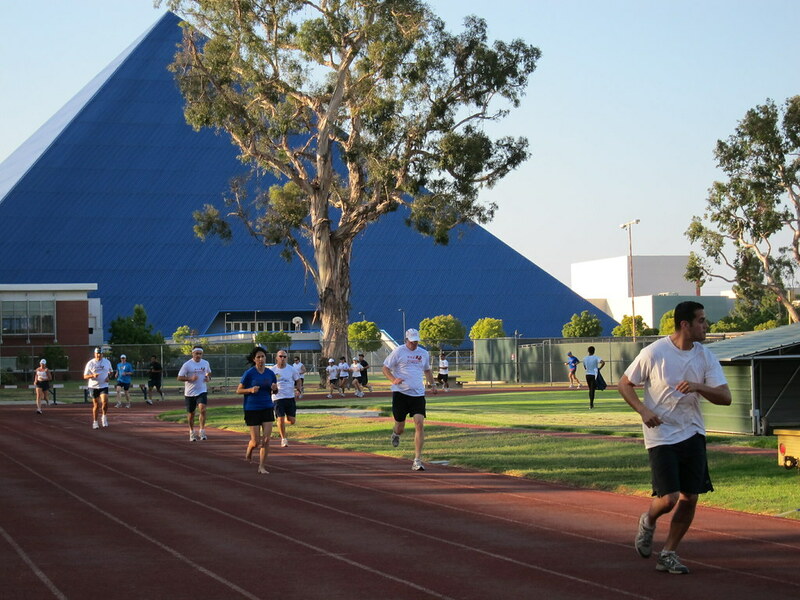 Last night, the Green Girl attended her second Sole Runners track workout at Long Beach State. After my positive experience last week, I was looking forward to another productive session. My only concern was a nagging pain in the middle my left hamstring that I woke up with on Sunday. I had applied a couple Phiten Discs and the pain had gone away so I was hopeful I'd be able to run. I got stuck in traffic and missed the ChiRunning body looseners. I arrived just as they were starting to do the three easy laps around the track. 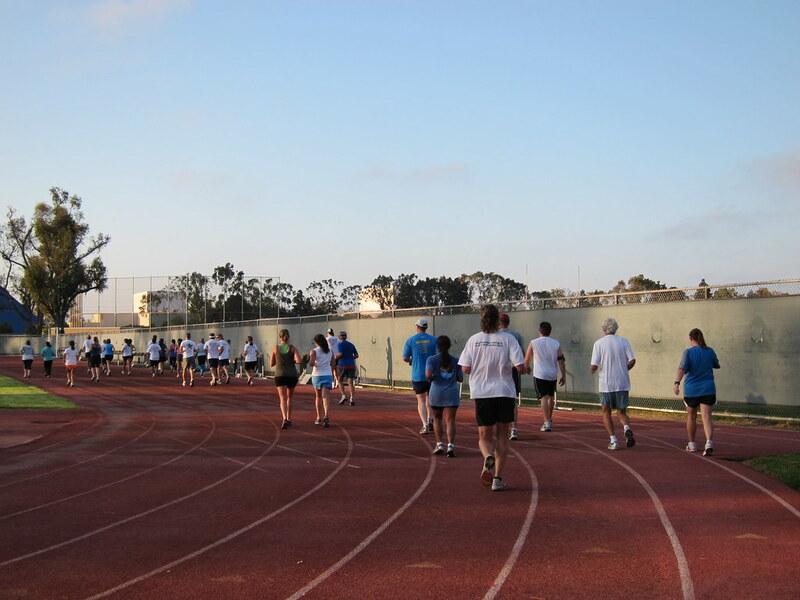 Once we warmed up, Coach Steve had us start the 100 meter drills. He had us do skipping, high knees, heel kicks, and crossovers. The heel kicks aggravated my hamstring. I opted out of the crossovers again for fear of re-spraining my ankle. After the drills, we walked a lap before we moved to the fast running. I ran a single lap at a medium pace but the pain in my hamstring became constant so I stopped. I talked to one of the mentors, Matt, and he recommended I walk, do some stretching and ice when I get home. I slowly walked a couple more laps and then laid out my yoga mat and sat down. George, aka 'Hillbilly Yoga', showed me some stretches for the hamstring. After I felt I had sufficiently stretched my sore hamstring, I got back up to walk a few more laps. A loud rumble in the sky caught our attention and we all looked up at some sort of large military plane flying overhead. We followed our track workout with our usual post-run yoga. When I got home, I iced my hamstring and then did some light stretching and foam rolling before I went to bed. I will book a massage today and take off the remainder of the week to allow my hamstring to heal before San Francisco on Sunday. good luck on the race this weekend. Thank you, Runners Fuel! I am hopeful that with rest, my hamstring will be ready for those hills! Glad you listened to your body! Woo-Hoo! A mid week massage!-FABULOUS IDEA! Good job giving in and taking a break instead of pushing through it--that's the stuff that will keep you out there for years to come! Sounds like a great workout group! Smart for listening to your body. Hope to meet you at SF! Good luck! Thank you, Rad Runner Girl, Miss Zippy, and Rio! 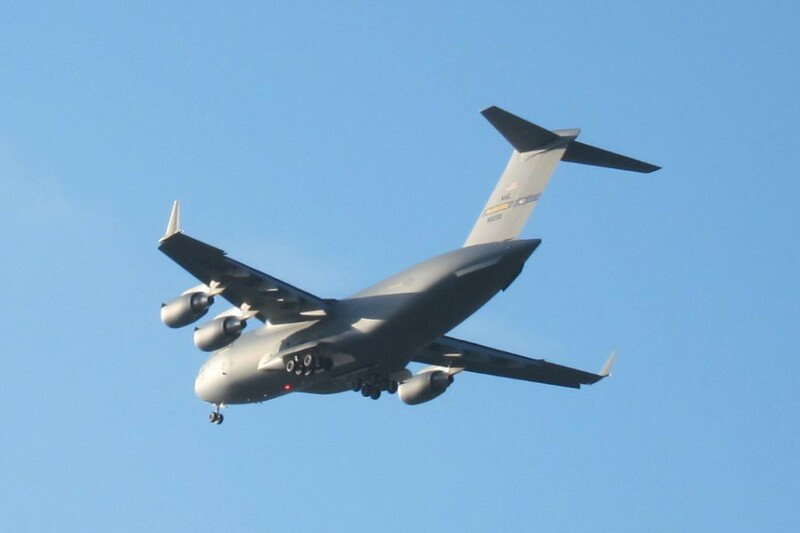 Airplane was a C-17 Globemaster III. As an Air Force Reservist, I work with these. They transport cargo and passengers worldwide. Thank you so much for identifying the aircraft, Traveller. Seems you are really taking care not to get injured. Chirunning and yoga before running is very safe. Happy running in the future.